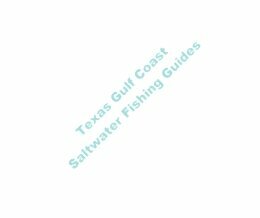 At Galveston Bay - Galveston Fishing Charters and Guides - Galveston bay inshore fishing - Freeport and Galveston fishing charters and guides for bay and offshore fishing. 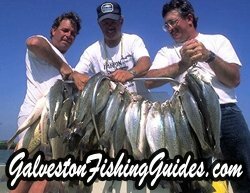 Galveston Offshore and Bay charters for the Galveston and Freeport Texas areas - Galveston Texas - Texas Saltwater Fishing Guides for the Texas Gulf Coast. Fishermen, thanks for visiting www.SaltwaterFishingGuides.com. Visit their web sites for detail information. I invite you to come spend the day with me Capt. Robert Liebert on Galveston Bay system or Matagorda Bay system. We well fish for the big three...Trout, Redfish, and Flounder. On these trips we can wade or drift and will have a fun safe trip. I have my Coast Guard license and Texas Guides license. We will be fishing out of my 24 ft Haynie H.O. and all rods, reels and tackle will be provided. I have been fishing saltwater my entire life and have logged thousand of days learning and studying the big three. To book a trip call Capt. Robert at 281-799-5728. For the Sabine Lake Fishing Guides Section....Click Here! Double click on the guide's photo or their website link to go directly to their own website. NOTE: Guide services are listed in alphabetical order. Come experience pure adrenaline with Captain Jason Woods. We offer year round fishing trips that meet the needs of a professional or an amateur. 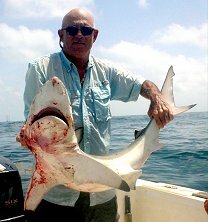 From shark fishing to bay and jetty fishing, we take great pride in providing an exciting fishing adventure. Captain Jason Woods has ten years experience fishing the near shore waters off Galveston Island. If exciting rod bending and line pealing action is what you are looking for....you have found the place! Offering the finest in Waterfowl hunting and Offshore & Bay fishing on the Texas Coast. Circle H Outfitters is a full time guide service specializing in: Duck Hunting, Goose Hunting, Dove Hunting, Deer Hunting, Turkey Hunting, Offshore Fishing and Bay Fishing with operations convenient to the Houston / Galveston area, Rockport and Bracketville, TX. Capt. Scott Hickman, owner of Circle H Outfitters, has been operating charters out of Galveston, full time for fifteen years. We specialize in fishing for trophy size Kings, Ling (cobia), snapper, amberjack and dorado. We also offer Shark & Tarpon trips and Bay trips for trout and redfish. Blue Water Trips Available!! 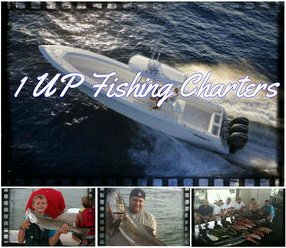 1 Up Fishing Charters has multiple boats and trips to choose from. 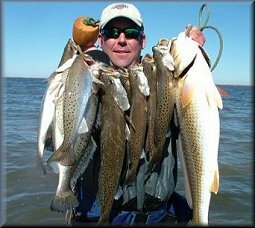 We run the Galveston bay complex fishing for trout, redfish, and flounder and offshore for red snapper and all other species we have here in the gulf.We offer family trips, company outings, bachelor parties, or even tournament fishing. Come take a trip with the 1 Up Fishing Team and see what Galveston fishing has to offer. Our captains and crew are very kid friendly! Capt. 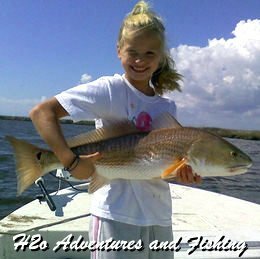 Joel Taylor - Experience a Fantastic Adventure fishing charter in Galveston Bays, Jettys, and offshore fishing for sharks, redfish, speckled trout, mackerel, and drum. Capt. Joel has 26' deep vee boats for safety on the big waters around Galveston. All groups are welcome, corporate, family, students, kids, and bass fishing fanatics. Captain Chris Howard I was born and raised in the Galveston area and have been fishing here for over 30 years. I am licensed by the US Coast Guard and Texas Parks and Wildlife. I run a 22� Blue Wave boat and offer Half day (5hr) and Full day (9hr) trips including afternoon and evening trips. That's right, you don't always have to get up at 4am to catch fish! I can accommodate any skill level, and kids are always welcome. Live bait is available upon request and I furnish all equipment. For more information you can contact me at (281)793-0267 or log on to www.bayfishingadventures.com for specials. Capt. Bryan Brawner is a full time fishing guide and has fished the Galveston Bay Complex for years. Capt Bryan knows the best spots to fish on the bay in any month of the year. He offers trips tailored for family enjoyment or for the serious fisherman looking for that trophy fish. Corporate trip packages and multi boat trips are also a specialty and available year round! Offshore and near offshore charters also available. 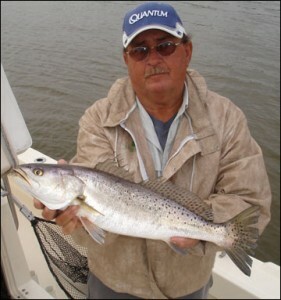 Capt Craig has been a full time Galveston fishing guide since 2008. Having a fun and exciting experience is what the Capt wants for you and will do everything necessary to make that happen. You will be riding in a 24 ft. Lake and Bay Backwater w/ a 250 Yamaha 4 stroke which is a very safe, dry and comfortable ride. Half day trips for 3 people are $450 plus bait. Give the capt a call for open dates and questions. Families and kids are especially welcome. Please checkout my website for further details. Contact Capt Craig Lambert at 832-338-4570. 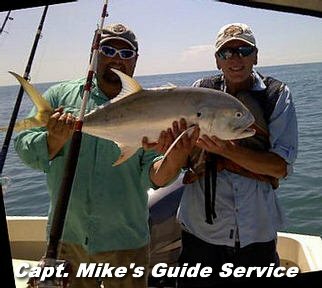 Captain Mike Eden is a USCG licensed captain and full-time saltwater fishing guide who provides full and half day fishing excursions in the Galveston Bay Area. Captain Mike runs a safe, solid, and comfortable 23 ft. Parker SE. Trips are for up to six people, and rates include fuel, live and dead bait, and all fishing gear. Call, email, or text to check a available dates, and book your Galveston saltwater fishing adventure. Texas Deep Sea Fishing is a family owned and operated full time business with a lifetime of professional Deep Sea fishing experience around the Freeport and Galveston coast line. 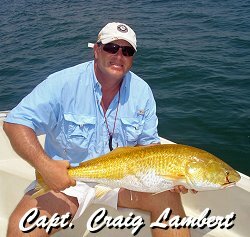 Captain Leaf Potter built his business by providing his customers exciting and memorable Texas Deep Sea fishing experiences. 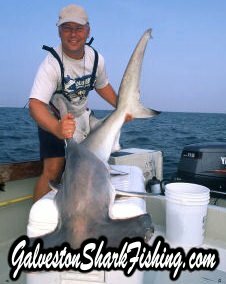 We are not a week-end or part/time business; we fish year round for big Texas Sharks, Tarpon, Bull reds, Snapper, King fish to name a few. All our Captains are experienced and Coast Guard licensed. Call 832-428-3340. 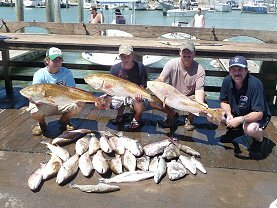 At Fishing Galveston Tx Fishing Charters, we have a trip to fit any budget. From night time flounder gigging, shallow water back marsh trout and redfish trips to hunting Giant Galveston Sharks we have a trip to meet any desire. Corporate entertainment to Family Fishing where kids are our specialty - we work hard before and during your trip to make sure you have the fishing trip of a lifetime. With over 60 years combined experience our Captains put you where the fish are and we target what's biting! Capt. 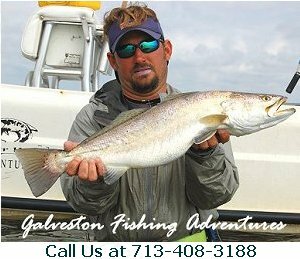 Robby Mielsch offers Galveston Tarpon fishing charters, Offshore fishing, and Galveston Bay fishing at Galveston, Texas. We are your source for Galveston deep sea fishing, Bay fishing, and Party Boat information as well. We have many years of experience tarpon fishing, offshore fishing, and fishing Galveston Bay. The type of experience that ensures you have a successful, exciting "Galveston Fishing Adventure"! At Galveston Fishing Adventures, our customer's satisfaction is our number ONE priority! For Fishing charters in Galveston Texas, Tarpon fishing, Bay fishing, or Galveston Offshore Fishing, give us a call! We always welcome any questions you may have about planning your trip. Capt. 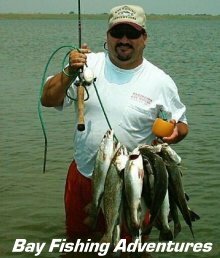 Steve Hillman is a year-round Professional Fishing Guide specializing in wading and drifting the Galveston Bay complex and Matagorda Bays with artificials for trout, redfish and flounder. Capt. Steve Hillman has lived and fished his entire life on Galveston Bay and knows where to find the fish. From wade fishing for trophy trout with artificials to fishing the near offshore waters for giant tarpon, he will work hard to make it a trip to remember. He will cater to your specific needs.... Family trips, corporate outings, buddy trips, or serious experienced trophy trout hunters. Parties of any size can be accommodated.....Call 409-256-7937. We specialize in offshore fishing out of the Freeport, Sargent and Matagorda areas. Capt. 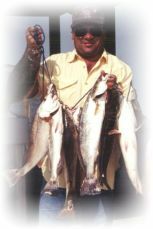 Chris is knowledgeable of the Gulf of Mexico waters and has been fishing the Freeport, Sargent and Matagorda areas for 20 years. 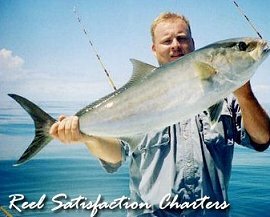 Reel Satisfaction Charters provides its customers an enjoyable and memorable trip for families, friends, business customers or co-workers. We welcome both the experienced and beginner fisherman. You'll be fishing aboard our 25ft. Contender, Hit-N-Run, powered by twin 200 HP 4-stroke Suzuki outboards. Call 979-373-8307, 979-373-8003, or 979-345-4988. 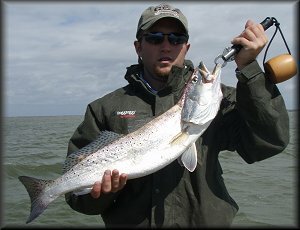 SPEC Some Action Adventures is a premier fishing guide servicing the Houston and Galveston regions. Captain Bobby Elliott has been fishing the Galveston Bay Complex for over 30 years. Take a ride in our 23' Parker Big Bay boat and turn your next fishing trip into an Adventure! This is Galveston Fishing at its finest! Call today at 713-598-3413 or email me at belliottfishing@gmail.com to book a trip. Capt. 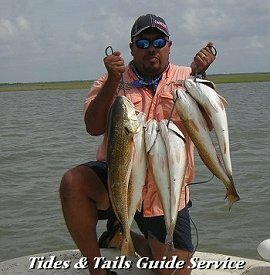 Mark Salazar of Tides & Tails Guide Service specializes in fishing for trophy trout, flounder and redfish by either drift or wade fishing. Capt. Mark has been fishing in the Galveston Bay waters for 17 years and definitely has the knowledge, experience and capability to ensure that you experience an exciting time fishing in Galveston Bay! Capt. Mark fishes east and west portions of Galveston Bay mainly using artificial lures, which is furnished to customers. Whatever type of fishing you like, Capt. Mark will provide you with an exciting fishing trip to suit your style of fishing!